There I said it, Changing the ration is much deeper than most of the attempts i presently see and as someone working in “Bridging ” That divide since 2003, I’m not sure those leading the charge understand the challenges! I’m not at many of the meetings and conferences, I’m in the field often till 12 midnight sometimes beyond! My eyes feel the challenge I understand that education is part of that process, and it’s as basic as the use of Gmail, search and even how to “look’ at a website! In Facebook It may be clicking through and links… many simply do not Know! To change the ratio we need to change culture – How we do things as well as the Infrastucture for getting technology to the masses! I’m In Brooklyn and neighborhood where local businesses see internet and electricity use as too high a cost to share with their customers. 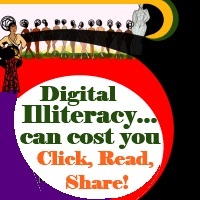 Digital Illiteracy is a huge problem even as FB use soars! What we do not know is slowly killing our community… literally The 45 minute route from my house to the best excuse of wifi (They covered their plugs this week) is a steady stream of empty building meant for businesses use! Unemployment is at about 40% many go without food and this a stones throw away from the new stadium! True tech adoption at the core where it matter, in business operations, supply chain management sales, is almost non existent There is a tendency to do exactly as we did before… without questioning result… it’s about the Facade not infrastructure! But what the community lacks in cash It makes up with “resources.. “Skill sets, Knowledge, experience, even our networks remain untapped!” My specialty is turning resources in to wealth. One of the businesses I have worked with reports a steady 20-30% increase in sales each quarter! Yes I get local businesses watching their quarterly growth. By next year I’ll get them to make quarterly and annual reports in each sector! What would happen if we pooled our resources together to uplift the small business sector! It’s the premise of Tibiae Tech… yet most cofounders are waiting till it looks “Right” before they say anything, so valuable help and resources is left untapped. I’m also guilty, Even though I’m part of the Thriving NYTech scene and actually know many of the names others quote , I today notified my linked in list, within 10 minutes two offers of support! Networking, asking for help is not culturally comfortable. As a leader it is one of the challenges I face! Getting this community to see its resources beyond cash and to utilize said resources collectively, even to access funding, continues to be a Challenge! Today as I spend the evening sending out the attached note to my Linked in Connections… I had no idea my linked in connections stood at over 1000, Fb, Twitter and Google plus together with an email list we’re looking at close to 20000, and about 80% of that email list .. I can identify. I’ve taken a major leap, launching a tech company specifically addressing the glaring problem of the lack of minority-owned businesses in today’s tech sector and the adoption of technology in today’s business culture. my cofounders and I have targeted Tibiae Tech to be situated in a Brooklyn area currently under-served by NY’s Booming tech evolution and will provide solutions via education, exploration, technology talent procurement, funding, mentoring, incubation, marketing and distribution. and wanted to get in touch and let you know. It is exciting, scary, overwhelming, fulfilling but most of all desperately needed! The response has been great and even before announcing we have 30 committed Businesses, program and Events Take a peak http://www.tibiaetech.com/startups/inaugural/ and feel free to contact me for more info! Thanks to The NYTech & Barcampers who freely shared their knowledge and ideas and my fellow entrepreneurs who helped test the theories in a live working environment! Now I’d love your support with access to space, Tech Talent, information on funding and pitching opportunities, partnerships, access to API’s, workshops in new technology for small businesses … and so much more! It would be great to hear from you. If you’d like to keep updated and support these new ventures Please add your name to our Launch Page http://Tuberiam.TibiaeTech.com and do share with a friend! When you get a chance, do send me an update.